With the holiday season being right around the corner, it is the perfect time to explore the great beyond with your family. If you are looking for the perfect destination to bring your family, then you should totally visit Bangkok, Thailand. This land of delicious tom-yams, papaya salads and best massages has everything you need to keep your whole family occupied, even your young kids. We know how fussy some kids can be when it comes to foreign food, but here we have compiled a list of cafes in Bangkok that your kids will surely love to visit. No kids or even adults can ever say no to the charms of a sweet, cuddly, soft teddy bear. 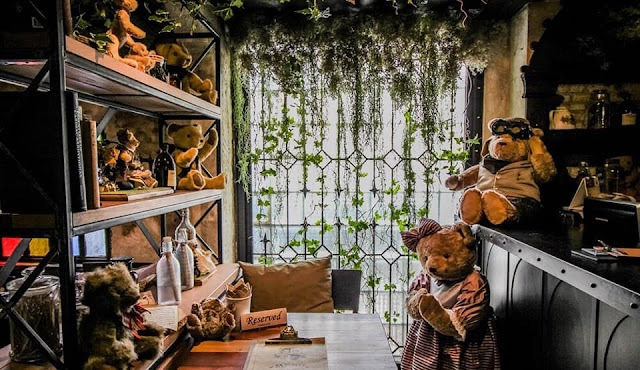 At the Teddy Castle Café in Bangkok, your kids will be welcomed into a beautifully decorated castle filled to the brim with fluffy teddies. Not only is the castle totally Instagram worthy, the food here takes your taste buds to a whole new level. While you wander away in this beautifully crafted teddy castle, do not forget to try bestselling Strawberry and Seaweed Salad. Your kid will surely be asking for more. The best thing about this café – there is a pool for the water babies which is already a plus point for most parents. Not only that, even for the fussiest eater in your family, this café is just perfect because here, you can design your very own meal. Add as much cheese or bacon to your eggs or have them in any other way exactly to your liking. 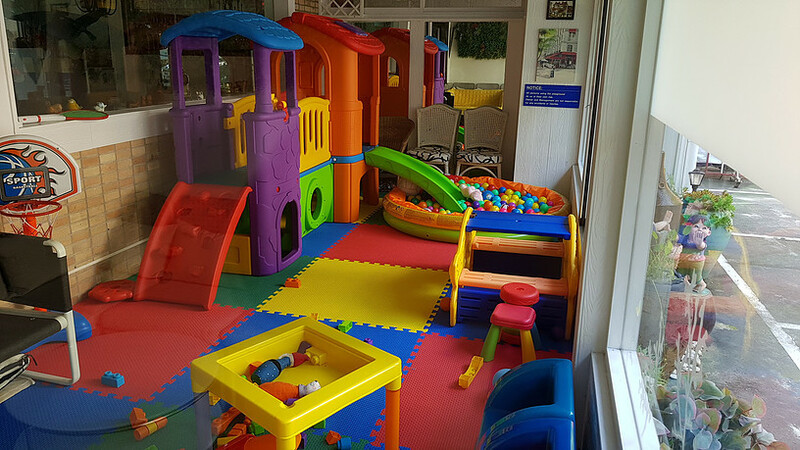 Aside from the pool, there is also a kid’s playroom for all those kids without a change of clothes for the pool. How perfect is that? This café will surely have your little ones and even you falling in love with man's best friend, the cutest dogs of all shapes and sizes. From big, fluffy breeds like Alaskan Malamutes to adorable and cuddly Chow Chows and even the friendliest English Sheepdogs, this cafe is the epitome of happiness at its best. While these soft giants might be the highlights of this café, they do serve pretty tasty pasta too. Do try their seafood Aglio Olio which is one of their best-selling menu. Are your kids fans of the Harry Potter franchise or any magical world? 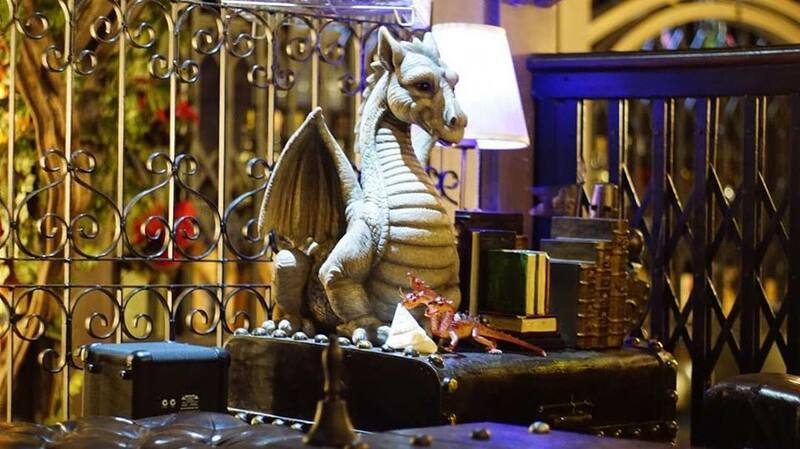 Then you should totally bring them here, a magical Harry Potter-esque café. Mocking Tales encourages you to never let the magic in you die out. Entering this café, you fight evil mean dragons with your child while eating the best, delicious desserts they have to offer. The desserts they serve are a treat to behold. Not only do they glow, some even catch fire. Woah.. Your kid will never want to leave this place. We have not been to any these cafes, but am locking them here for our next visit to Bangkok! 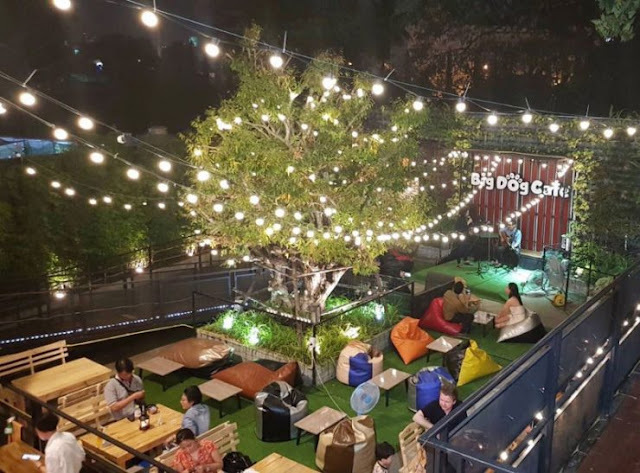 With these cafes that will surely pique our kid’s interest and uninhibit their big imaginations, why not make a trip to Bangkok that will surely be filled with sweet memories? The best thing about this travel – it does not even have to be expensive. You can find cheap tickets on Traveloka, the best online travel platforms for flights from Kuala Lumpur to Bangkok or even from Singapore itself. Do check out yourself before it's too late. 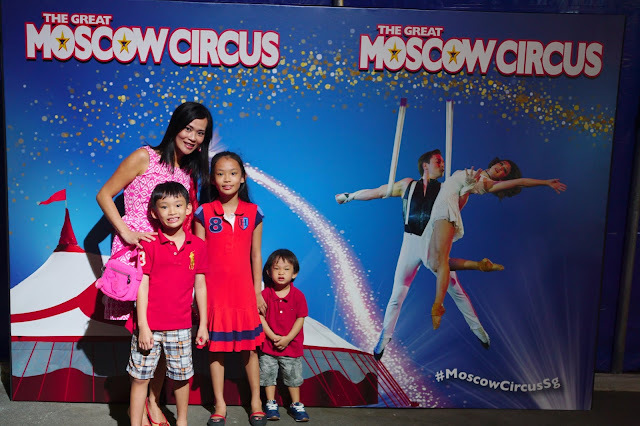 We spent a thrilling night with the Moscow Circus beside Marina Bay Sands, where a traditional European atmosphere was intimately created. 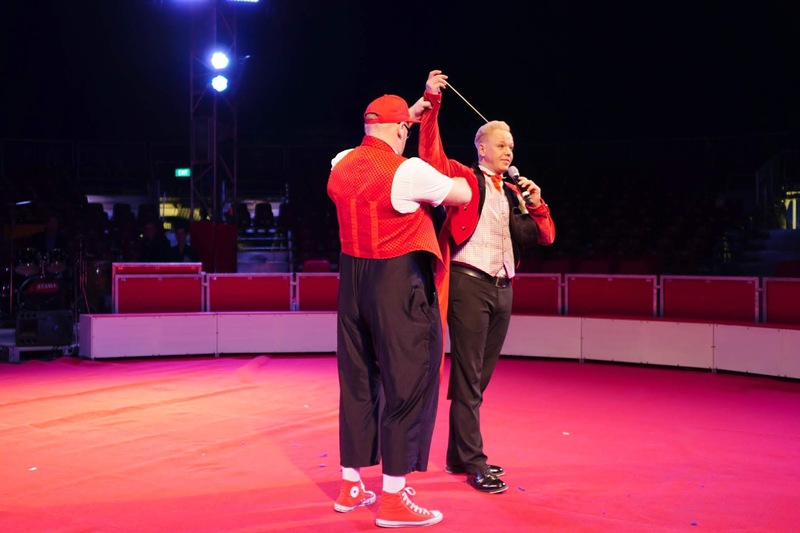 The circus brought in more than 100 tonnes of equipment and featured more than 16 sensational acts, blending traditional circus acts with the new. 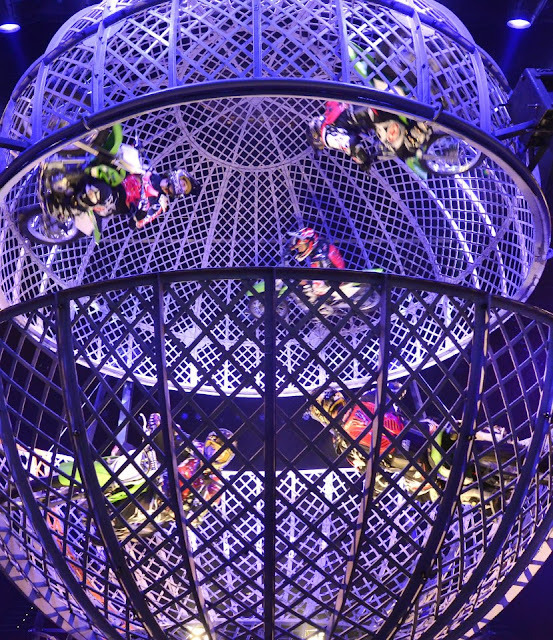 It mixes clowns and acrobatic artists with daredevil motorcyclists, death-defying aerial stunts, jugglers and illusion and much more! All supported by a live circus band. Yes, live band marks up a totally different atmosphere. Watching performances under this red and white circus tent, I had a sudden flashback to the movie, The Greatest Showman. The movie that left my kids longing to see a circus in person. And we are so Thankful to be able to catch one here, in Singapore! I hope this circus memory will live in them forever. 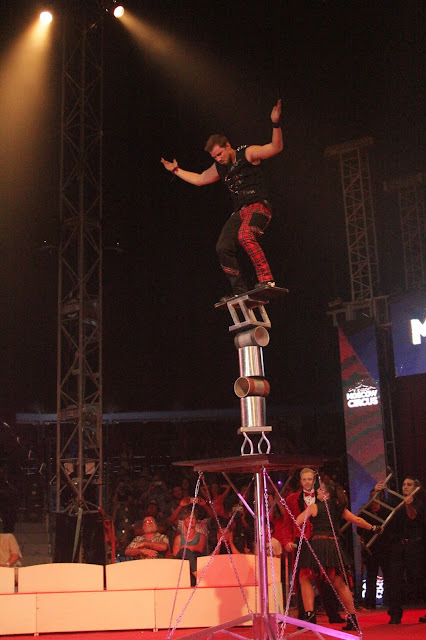 The circus was filled with so much fun and entertainment that swung our mood from the hearty hilarious moments to thrilling death-defying moments. It was crazy how some acts were even possible! And how they have to be put together so flawlessly perfect throughout the many shows ahead, till 23 November. It was insane and jaw dropping to watch them perform without any safety net or harness on them. Imagine the amount of toil, perspiration and hard work sowed into their training to get every act perfect. It is no wonder when we say that the circus is the most sincere form of performance. Other than good hearted fun from the ringmaster and clowns, my favourite 2 acts were the double wheel giant and quick change transformationists. Double wheel giant was where four fearless acrobats, The Douglas Boys risk their all to spin stunts on really high, 4 moving wheels. The quick change transformationists couple all the way from Havana, Cuba were light hearted and fun to watch. It was an amazing act where the couple changed beautiful costumes one after another, within seconds! Magic, illusion or tricks? We were amazed at their possibilities. And nope, no animals in this circus because animals belong to the zoo. Not circus. Still not convinced? Here are more reasons to catch the show! Russia has been known for decades as the capital of circus arts. For more than 100 years, Russian circus talents have been thrilling audiences across the globe with spectacular performances that are full of power, artistry and world-class athletic skills. We know our money will be made worth! 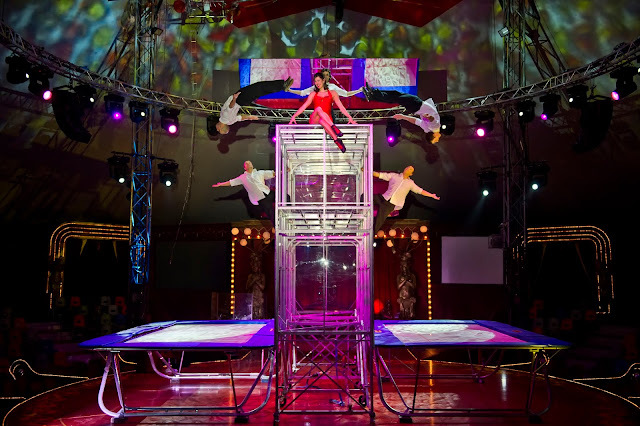 The Moscow Circus does not only showcase their homegrown talents, but also international talents from Belgium, Germany, Argentina, Switzerland, Cuba, Ukarine, Canda, Colombia, the USA and Mexico! It is a company of superstars, carefully selected over the last 12 months to bring on this world premiere program. Their talents and skills are out of this world! The last heard of The Great Moscow Circus was 10 years ago. We do not know when is the next come back, it is better to hit than to miss. With nearly 45 circus superstars who are highly sought after around the world, it is not an easy achievement getting all to come together for a mega 2 hours show! Actions speak louder than words. This is a circus full of acts, and few on words. It is one that can be enjoyed by anyone of any age, from the young to old. Regardless of any language preference. I was initially hesitating to bring Juboy, who is only 2 years old. I was not sure how still he could stay throughout the 2 hours show, but I am glad I eventually did! He sat through and enjoyed the show tremendously. After each clown act, he pointed out that the clowned cleaned up his props for the next segment of show. He had better be mimicking the same for his toys. And kids below 3 enters FREE! It was most wonderful that the tickets are made affordable for families. Unlike shows meant for couples, you only need 2 tickets. This is one show you need to bring the whole village of family! And life is made a little easier with children (3 to 12 years old) and senior citizens (above 60 years old) prices available. Go for low budget seats if your wallet prompts you to. No audience will be more than 11 metres from the action! So even the final row of seats are of great view. Do not miss this discount - 25% off A, B and C Reserve tickets, for all shows on Wednesday 31st October and Saturday 3rd November, 12pm. Get them fast! I am sure this is one circus that will stay in our memory for a mighty long while, till the next. The kids and I really enjoyed ourselves. An eye opener from the usual shows, musicals and performances. This is extraordinary! 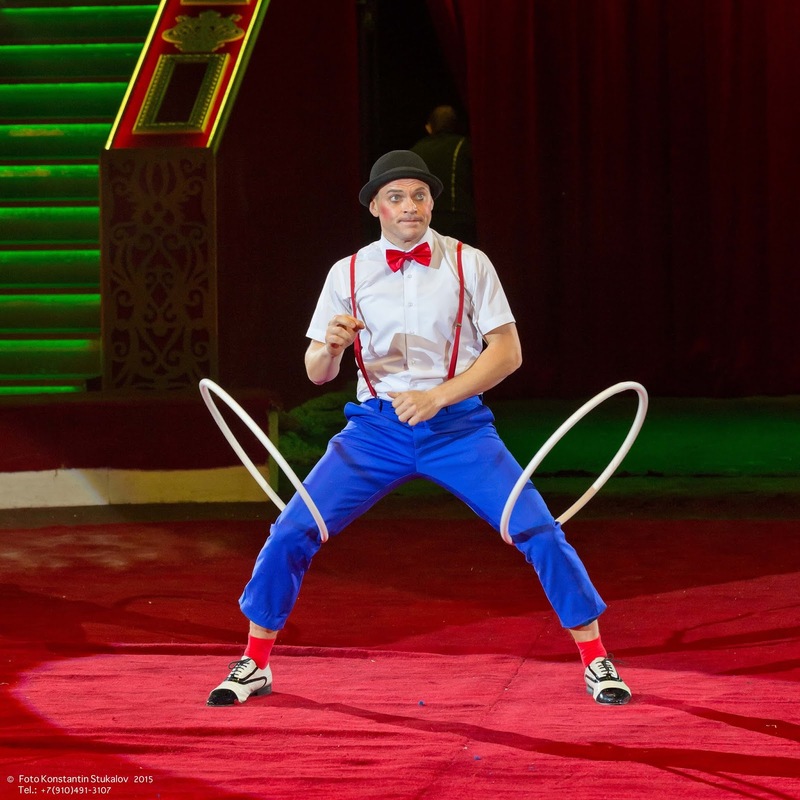 The Great Moscow Circus is affordable, a great family entertainment of thrills and fun of the circus of yesteryear with all the skill and daring of today's heroes. The BIG TOP TENT is fully airconditioned and seats are elevated, and tiered, for patron comfort. *We were given tickets for the purpose of this review. All photos (unless otherwise credited) and opinions are solely ours. The Great Moscow Cricus returns! 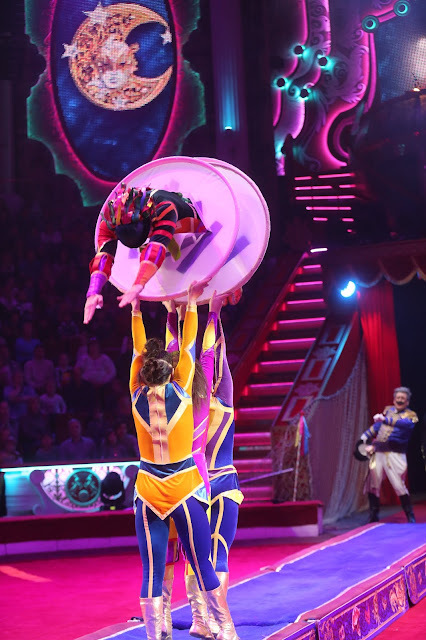 Direct from Moscow and the circus capitals of the world comes this year’s heart-pounding family spectacular – THE GREAT MOSCOW CIRCUS. Boasting the world’s most dangerous and death-defying acts, including the Wheel of Death and the Motorbike Sphere of Fear, THE GREAT MOSCOW CIRCUS sees the mighty red and white circus big top transformed into an astonishing, high octane, fun-filled entertainment destination. THE GREAT MOSCOW CIRCUS, returns to Singapore for the first time in over 10 years, with over 45 performers – acrobats, clowns, jugglers, daredevils – all circus stars renowned world-wide for their theatrical flair and breath-taking talents. Circus doesn’t get much wilder than this! 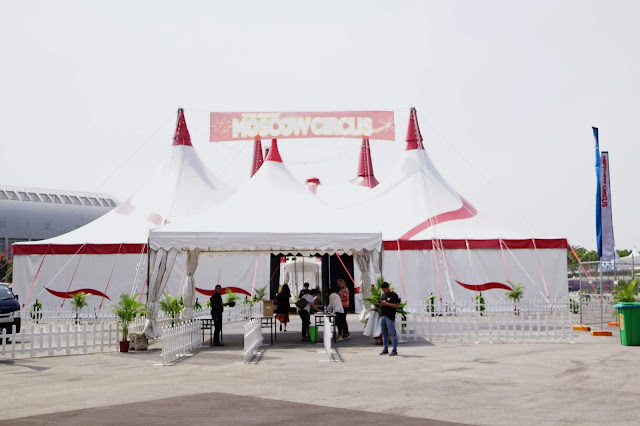 The Great Moscow Circus Big Top is a far cry from the canvas tents of old. The ‘traditional’ large tents, commonly known as ‘Big Tops’ were introduced in the mid-19th century. The Great Moscow circus million-dollar tent was specially created for the Singapore season by leading Italian tent manufacturers and took several months to build. It is brand new and packed into 7 x 40ft containers. This Big Top stands at about 17 metres high and is 40 metres in diameter. It is supported by 4 steel masts, known as King Poles, that each stand at 18.5 metres high. The raising requires a team of approximately 20 people to raise the 4 King Poles and the more than 130 side poles and 250 tent pegs to secure the structure. The Big Top can accommodate 1,600 people per show in all chair seating. The ring is 10 meters in diameter and no audience member will ever be more than 11 meters from the action so every seat provides a great view of this spectacular show. The entire site set-up includes installation of the Big Top, Foyer Tent and dressing room tent. Book from now to 12 Oct (2359hrs) to get 25% off ticket prices! Offer applicable to shows from 25 October to 2 November on Ringside to D Reserve tickets. Feeling the excitement already?!! We think this circus makes a great treat for the whole family of young and old. You will be delighted to know child (3 to 12 years old) and senior citizen (60 years old above) rates are available. A good opportunity to bring the village for circus entertainment! This is one circus without animals, and you know a circus without animals makes it a more worthy support. Animals belong to the wild and zoo, not for circus. The BIG TOP TENT is fully air conditioned and seats are elevated, and tiered, for patron comfort.